A correction and amended post: The original of Flight into Egypt (also known as Flight II) has been to sold by the Flagship Deseret Book on Temple Square to hang in the Guest Home for the Stockholm Sweden patrons traveling to the Temple, (not in the Temple proper itself). It will remain in the Guest Home as its permanent home. It's buyer was not from the Temple Presidency. Just setting the record straight. 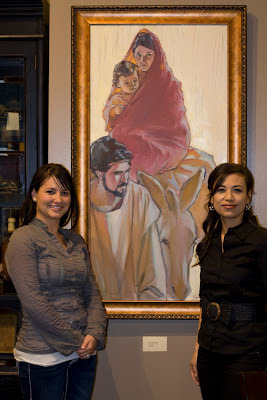 I am posing with Raquel Machado Ward, the model for Mary, in front of the painting Flight into Egypt (Flight II) at the Flagship Deseret Book on Temple Square, March 26, 2011. This was a new experience for me, the first time consigning an original to Deseret Book. The client then requested that the painting be removed from the stretcher and rolled for transport on a plane to Sweden where it will be reframed. Luckily, Deseret Book handled all the details on that end. Being the guest artist at Deseret Book's Lunch and Learn was such a positive experience, making lots of print sales and making my goal to sell at least one original (the other original I brought out is Five That Were Wise), that I am looking forward to returning in August 2011 for a similar guest appearance. The funny tidbit behind this painting is that even though it is named Flight II, it was really the first attempt at the subject matter, while the second attempt (square version) just entitled Flight, which is the more recognizable version, is the one entered into to the last International Church Art Competition and the one to receive the Purchase Award and is now owned by the Museum of Church History and Art. I really had not intended on showing this piece very seriously anywhere. But I guess that for some reason, something about the theme perhaps has resonance with its viewers, which I think is in no small part due to a wonderful model, Raquel Machado Ward who makes an engaging Mary whose face draws in the viewer. She is Brazilian, actually, but has a great ethnic look, which is why I selected her. She has been my model for Mary for at least 10 years. Congratulations! It is a beautiful painting and it will be perfect for the temple! That is such a great honor! You deserve it. I LOVE your paintings and I am excited to hear you are coming back to Utah in August since I missed the last demo/lunch. That's great that your painting is in a temple what a step up for you! I just stumbled across your mormon.org video profile with my girls (who are half filipina!) and we not only thought you were such a happy, fun person, but truly fell in love with your amazing artwork. I hope to have a Rose Datoc Dall print in my house soon! Thanks so much for sharing your beautiful work and your vibrant personality. We'll be following your work! I also stumbled across your video profile at mormon.org and I absolutely love you're work! I admire you so much for being both a successful mother and wife, and a successful artist. It inspires me because I hope that I can also feel successful with my art while raising my family. Sometimes I get discouraged cause it can be so hard, but you've inspired me to keep on plugging away at it. So, thanks for being an inspiration! And Laura, I spent much of the first 20 years of marriage only painting hear and there a little while raising my kids. What you see on Mormon.org is the culmination of little drops in the well, here a little, there a little over 20 years. Raising a family is the toughest job there is and it can be discouraging, but raising kids is rewarding after all that. My family keeps my head present in what is really most important and once I embraced that, I sought the Lord's help in knowing how, or if art ought to feature in my life at all, how it fit into my family life. I also prayed a lot for help in parenting too. Because art can be so time consuming which can take away from the family, I had to make it worth my time (which really belongs to the Lord) I asked how to use my art to build up the kingdom. My answer was to follow His timetable, not my own, being told to be patient, and to be content with whatever the Lord allotted me, however that was to take shape. He knew my righteous desire and have let Him author how my career took shape. That faith that it was in His hands has sustained me, because there are ebbs and flows, seasons of working and seasons where there is not time for art because you are needed elsewhere for a time, church callings, kids activities, etc. And some of the best advice is not to compare yourself to others' art careers which seem to be whizzing by you. Ignore them. You have to do what is best for you and your family. Please do keep plugging away and if I could go back and do things over, I would have made more family moments in the studio. I have had a few with my kids there, but I wish I could have more so. It is so worth being the mom and being mentally present for them, truly embracing and loving being a mom (loving it can be challenging). If you want my advice on the one thing that can make all the difference in the world, it is to pray to know how art can fit into your schedule, how to manage your time, how to parent, how to do your church calling, help in every aspect of your life, use the atonement for mistakes, and He will guide you. That was the biggest life changing practice that features into my day everyday so I would highly recommend it. Thanks again for your comment!